Jules Evens weaves history, science, and personal anecdote into an absorbing chronicle of one of the most biologically diverse places in North America. His account of this enchanted "island in time," separated by tectonics from the rest of the continent, provides a comprehensive overview of the Point Reyes Peninsula, exploring its dynamic character and its haunting appeal. 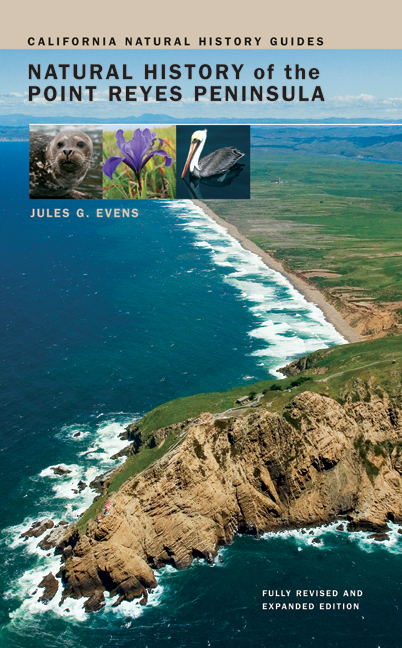 Evens thoroughly investigates the climate, geology, and flora and fauna of Point Reyes, giving special attention to its most characteristic species and their ecological relationships. He delves into the past as well, evoking images of salmon-swollen creeks, herds of elk, and canyons echoing with the cries of cougars to enliven our imagination and set the stage as he traces the changes that have occurred at Point Reyes since the first Spanish explorers visited its shores in the late 1500s. Extensively illustrated with color photographs, original illustrations, and maps, the book also includes species lists for the reptiles, amphibians, birds, mammals, common invertebrates, fish, and plants found on the peninsula today, making it an essential companion for anyone who plans to visit one of California's most unique natural areas. Jules G. Evens, naturalist and writer, has lived in the Point Reyes area for over 30 years. He is a long-time research associate with Avocet Research Associates, Point Reyes Bird Observatory Conservation Science, and Audubon Canyon Ranch. He is the author of Introduction to California Birdlife (UC Press) as well as many scientific papers and natural history articles.